Shri J P Nadda, Union Minister for Health & Family Welfare while addressing the ‘India marches towards FP 2020: A meeting of the India Caucus’ at the International Conference of Family Planning at Bali, Indonesia stated that the country has undergone a paradigm shift and now family planning has emerged as a key strategy to reduce maternal and child mortalities and morbidities. He further added that there has been a key emphasis now on promotion and provision of spacing methods. Considering that 45% of the country’s maternal deaths occur in the age group 15 to 25 years where 47% of the total fertility is also clustered, India is moving from limiting to delaying and spacing for wider health benefits. India has achieved more than 65% reduction in maternal mortality from 1990 to 2011-13 against the global achievement of 47% during the same period, he stated. ‘Family planning is just the first step on a long journey towards growth, equality and development. 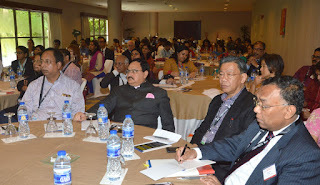 It works not just because smaller families can be healthier and wealthier but because empowering women is the key to growing economies and healthy open societies’, Shri Nadda added. Shri Nadda stated that India has been consistently making efforts towards improving health and reducing fertility for sustainable development ever since the world’s first national program was launched by the country in 1952. India formulated its National Population Policy in 2000 which lays emphasis on reducing the unmet needs for family planning, improvement of health care infrastructure and attaining Population Stabilization by the year 2045. During the historic London Summit on Family Planning India committed that family planning shall be a central part of the government’s efforts to ensure Universal Health Coverage and complying to the commitment the country adopted an integrated RMNCH+A approach with reproductive health being the first pillar to achieve the health goals of the country, the Union Health Minister mentioned. In India FP 2020 has been utilized as a platform to focus on improving access to Family Planning services through provision of fixed day static services, improving the overall quality of services, influencing the demand for contraceptives and expanding the basket of choices, the Health Minister noted. India is also committed to ensure that family planning information, commodities and services are provided absolutely free to every client including 200 million couples in reproductive age group in every nook and corner of the country in collaboration with partners that include civil society organizations and the private sector. He also said that recently there has been increased focus on quality of family planning services through advocacy with states, support to states through NHM for ensuring quality and improved monitoring of the program. India has been in the forefront of expanding post partum IUCD services and since inception almost 1.4 million insertions has been done. At village level 0.9 million ASHAs are delivering contraceptives (Condoms, Oral Contraceptive Pills & Emergency Contraceptive Pills) at the doorstep of clients. ASHA has been instrumental in counseling the couples for delaying the birth of first child by at least two years and maintain a healthy spacing of at least three years between the first and second child, he further added.